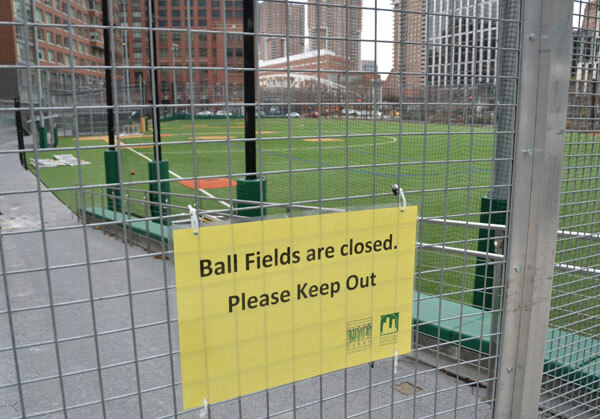 The Battery Park City ball fields were largely destroyed by Hurricane Sandy in 2012, but expedited repair work allowed them to reopen the following spring. 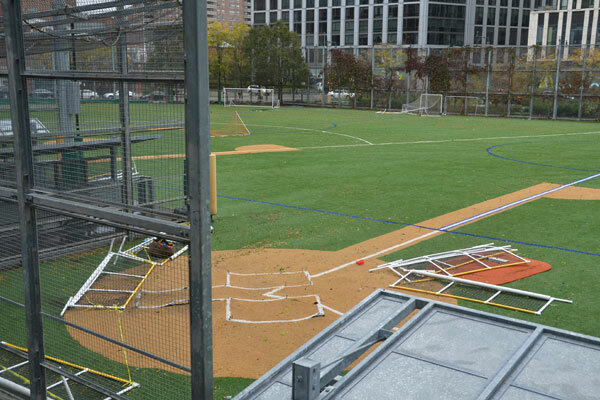 Tonight (Thursday, March 21), the Battery Park City Authority (BPCA) and Community Board 1 (CB1) will co-host a public meeting to review resiliency plans for the ball fields in Battery Park City’s northern section. The meeting, which will begin at 6:0 pm, will be held at Six River Terrace, next to Le Pain Quotidien and opposite the Irish Hunger Memorial. This session will include updates about evolving aspects of the plan to safeguard the facility against future extreme weather events (such as 2012’s Hurricane Sandy), as well as opportunities for resident comments and questions. The ball fields, which are a treasured amenity for Lower Manhattan families, were effectively destroyed by the 2012 storm, and then repaired on an expedited basis to re-open the following spring, in time for Downtown Little League’s annual Opening Day ceremony. But while that preliminary rehabilitation work succeeded in making the fields available once again, it did little to prevent future damage from similar climate disasters. This rendering shows the kind of permanent flood wall that Battery Park City Authority planners envision for the West Street side of the fields. To address this longer-term priority, the BPCA hired as consultants an arm of the Parsons Transportation Group, which advises government and corporate clients on large infrastructure projects. The Parsons team came up with two broad recommendations for the ball fields. First, they proposed erecting a permanent flood wall around the eastern boundary of the facility (which fronts West Street), with arms extending around the sides on Murray and Warren Streets. This would protect the fields from flood waters that approached from the West Street side, as happened in 2012. Because West Street is a depressed channel, it functions like a dry riverbed during a storm, allowing incoming incoming waters to accumulate, and then sluicing them at high speed along its length. Thus, when the Hudson River overtopped its banks at two points during Hurricane Sandy — near Pier A, at the Battery, and near Pier 25 in Tribeca, this water spilled into the culvert formed by West Street and was sent gushing into the ball fields. On Murray Street, near the point where the fields abut the Asphalt Green Community Center, resiliency measures are likely to take the form of deployable barriers, which would be set in place only when a storm is approaching. Second, the Parsons consultants advocated for deployable barriers at the ball fields entrances on Murray and Warren Streets. These measures, along with waterproofing precautions on the two residential buildings located on the facility’s western side, are also aimed at protecting the Asphalt Green Community Center, which sits adjacent to the fields. Once the Parsons team had completed its recommendations (in 2014), the Authority began looking for a vendor to design them. Last spring, the BPCA issued a request for proposals to firms that would design the measures Parsons had suggested. In June, the Authority hired STV, at a fee of $815,000, to create detailed engineering drawings for the project, and then manage the firm that will eventually be hired to implement these plans. STV has worked on multiple projects in and around Lower Manhattan, such as the World Trade Center Transportation Hub, the redesign and reconstruction off West Street, and planning for the upcoming redevelopment of Governors Island. At the June 19 meeting of the BPCA’s board, Gwen Dawson, the Authority’s vice president of real property, explained that STV was being hired to design a flood wall as tall as eight feet, but with varying heights, depending on the elevation and contour of the ground.